The Fed officially has a new Fed Chair, Jerome Powell. And ever since he took office, it is clear that “something” has changed at the Fed. That something is the famed “Fed put” or the idea that the Fed would immediately move to prop up stocks any time they began to fall. Powell made ZERO mention of the sell-off or of stocks in his prepared statements during the swearing in ceremony. Indeed, he didn’t mention the markets once. Instead he mentioned rate normalization, balance sheet shrinkage, and regulations. 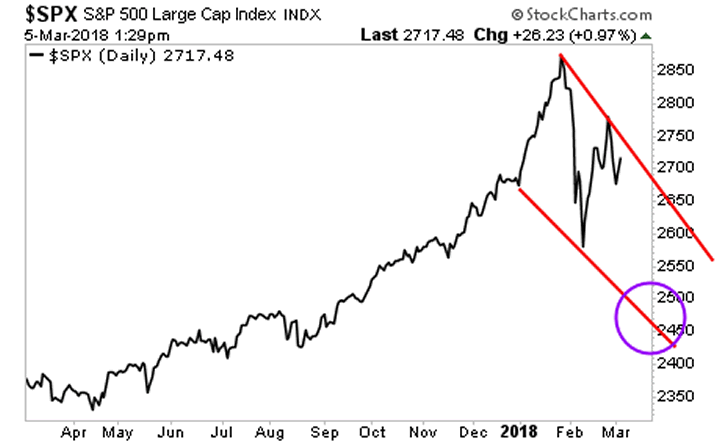 Again… Powell focuses on Too Big to Fail, normalization, balance sheet shrinkage, and regulations. It would be easy to shrug this off as a one-time deal, except that I’ve picked up on a note shift in Fed official rhetoric since Powell took office. To understand why this statement is astonishing, you first need to understand the source: Bill Dudley is one of the BIGGEST doves in Fed history. This is a man who always pushes for more Fed intervention/ liquidity. In 2010, when QE 2 wasn’t even over yet, Dudley was already pushing for another round of stimulus. In 2011 he was calling for the Fed to literally “prop” up the housing market. In 2012, at a time when the Fed had already printed over $2 trillion and the US was supposedly three years into a “recovery” Dudley was calling for even “more aggressive” monetary policy. By the way, Dudley was calling for this AFTER the Fed had already launched QE 3. In 2013 Dudley called for more QE if unemployment didn’t fall. Again, this was in 2013… after the Fed had already implemented QE 1, QE 2, Operation Twist AND QE 3. With that in mind, the idea that Dudley would call a violent 10% stock market collapse such as the one the markets faced in early February “small potatoes” is incredible. 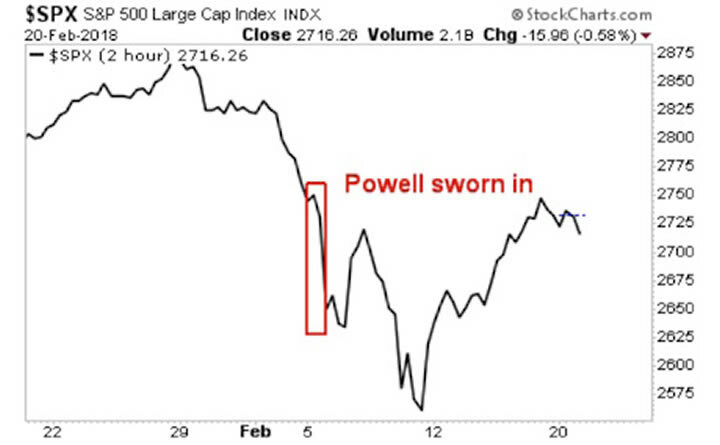 And it indicates that the Powell Fed will have a very different attitude towards the markets. The recent stock market sell-off and jump in volatility will not damage the economy’s overall strong prospects, Cleveland Fed president Loretta Mester said on Tuesday in warning against any overreaction to the turbulence in financial markets. “While a deeper and more persistent drop in equity markets could dash confidence and lead to a pullback in risk-taking and spending, the movements we have seen are far away from this scenario,” Mester said of a market rout that cut more than 10 percent from major stock indexes. Put simply, the new boss is not the same as the old boss for the Fed… at least for now. The Powell Fed is clearly not interested in propping up stocks at every single drop. Which means, stocks have a long ways down before they finally bottom. Indeed, as I write this, the S&P 500 is forming a clear downward channel. The ultimate downside target for this move is 2,450. Big gains are there to be made by those who play this move with the right investments. We’ve extended our offer to download this report FREE due to the market breakdown. But this week is the last time this report will be available to the general public.